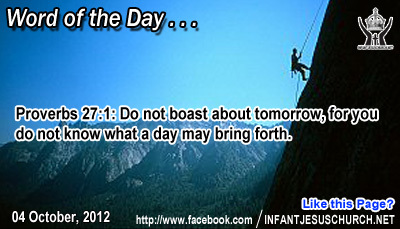 Proverbs 27:1: Do not boast about tomorrow, for you do not know what a day may bring forth. Heavenly Father, give us the strength to grasp the moment and live the life today that will satisfy you and bless others. Help our heart feel the urgency of today and act with courage, kindness, and salvation instead of disturbing so much about what may happen tomorrow or next week. Give us the nearness of the moment we see in Jesus. In Infant Jesus' name we pray. Amen. Seventy was a important number in biblical times. Moses chose seventy elders to help him in the task of leading the people all the way through the wilderness. The Jewish Sanhedrin, the leading council for the nation of Israel, was composed of seventy members. In Jesus’ times seventy was detained to be the number of nations throughout the world. Jesus specially made the seventy to a two-fold task: to speak in his name and to act with his power. Jesus gave them orders for how they were to carry out their ministry. They must go and serve as people without cunning, full of charity and peace, and simplicity. They must give their full concentration to the proclamation of God’s kingdom and not be unfocused by other lesser things. They must travel light – only take what was necessary and leave behind whatever would sidetrack them – in order to concentrate on the task of speaking the word of the God. They must do their work, not for what they can get out of it, but for what they can give liberally to others, without expecting reward or payment. “Poverty of spirit” frees us from greed and worry with possessions and makes ample room for God’s provision. Saint Francis Assisi followed the same steps to proclaim the good news of Jesus. The Lord wants his disciples to be reliant on him and not on themselves.